You need a trading backup plan … because your hardware is going to fail. Period. The original version of this article appeared in January 2010. I’ve been banging on about having a backup plan for years and years. The number of “please help, I’ve lost everything” emails I would receive on a regular basis, frankly, really scared me. So I made sure I was covered and I recommended a simple trading backup plan whenever I could. I thought everything was fine. No need to worry. Until, in October 2018, the freakiest series of hardware failures hit me (and Mrs. Emini-Watch). And it took me out of full-time trading for over a month! Needless to say, I learned a lesson or two from the experience. So time to re-visit my trading backup plan, update and improve it. It used to be a “Simple 5 Step Backup Plan” but it has needed to be expanded. So here’s my (new) “7 Step Trading Backup Plan” … learned the hard way. Internet failure from ISP outage, power blackout, etc. Computer failure from hard disk crash, motherboard failure, etc. Time it takes to replace hardware, restore Internet service, etc. The Internet failure is a minor inconvenience – as long as you can get out of any open positions. On the other hand, the computer failure can be serious. You can lose months of hard work and it can take weeks to restore your data and computer configuration. What I hadn’t realised before October 2018 – and what prompted this latest re-write of the plan – is that the delay in replacing hardware could also potentially take weeks and be crippling. And all of this is incredibly stressful. The feeling in the pit of your stomach when you’ve lost literally 1,000s of hours of work and you realize you’ve got days ahead of you trying to rebuild you computer and charts. The telephone calls with tech support trying to troubleshoot a software or hardware failure. And in my case, all this happened in France – so the tech support telephone calls were in French! The better trading platforms all have built-in, automatic backup functionality now. TradeStation, my preferred trading platform, allows you to backup pretty much everything: indicator and system code, charts and chart settings, hotkey and order configurations, historic data, etc. Scheduling regular backups will allow you to get back to speed quickly after a catastrophe. Personally, I run the auto-backup function every day at 4am. I backup everything except the data cache and I save the last 25 backups. 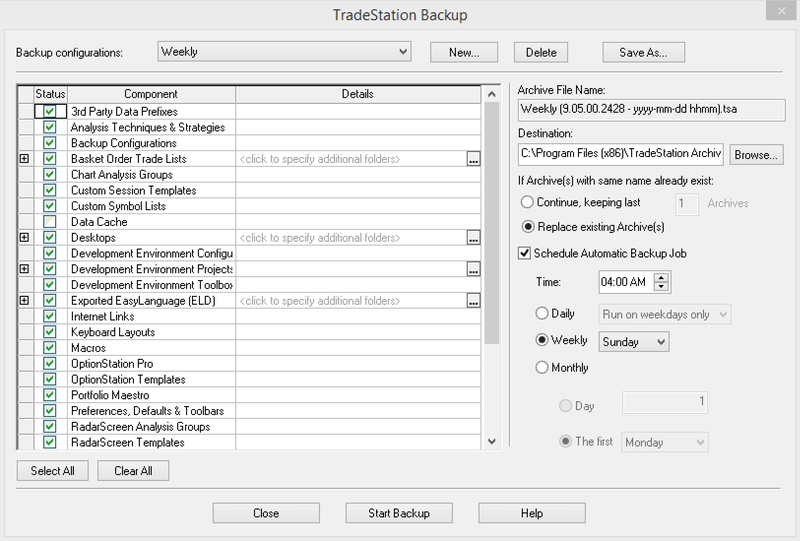 In TradeStation, use this sequence of commands to set your backup: File > Backup/Restore TradeStation > Backup TradeStation > Select Weekly > Select All > Untick “Data Cache” > Tick Schedule Automatic Backup Job > Select 4am, Daily > Close. Your settings should look similar to the image above. Remember, your TradeStation needs to be switched on for the auto-backup to work! Lastly, check where the backup file is being saved. The default is to save it to a folder within your application folder on your hard drive. So you can still have a hard disk crash and lose the backup files. Right? So you need to make sure that the backups are being saved to a folder that is also being backed up – more about this in Step 2. External hard drive backup devices are very popular and cheap these days. But I avoid them like the plague. What if the external hard drive gets corrupted? What do you do if you’re travelling? What if you have a fire? What if you are burgled? The thief usually grabs everything – the backup drive too! But fire and theft are the least likely catastrophes you’ll encounter. You know what’s more likely? You let “Little Johnny” play online computer games and he’ll accidentally download some hideous, crash-inducing virus. Or worse yet, you’ll do it yourself – mucking around with some setting. There is a much better way. An online or cloud backup service. I’m not sure there are big differences between providers, but because I’m a Google fan (and use a dozen or so of their services) I use the Google Drive service. Then I sync my computer documents to my Google Drive storage, using the Google Backup and Sync app. Then I go the extra step – and I backup the backup, using a service called Backupify. It only costs $5 per month and it is very simple and intuitive to use. The service has changed a little over the years and is now focussed on enterprise customers, so you access the service though a Google G Suite account. But it keeps me safe in case my GMail or Drive accounts are hacked. What about an Internet connection failure? The worst case scenario is your Internet connection going down while you’re in a trade. In this case you might not have time to re-boot your wifi router or call your Internet provider and troubleshoot. You need to be able to manage your way out of your trade. The simplest solution I’ve found, is to place your stop loss and profit target orders (as an OCO pair) automatically when you enter the market and use a broker who keeps your orders “server side”. As soon as your buy/sell order to enter a trade is executed, a pair of linked profit target and stop loss orders will be sent to the broker’s servers. These orders will sit there – with your trade active – until either exit order is hit. Either your stop loss gets hit or your profit target gets hit. Then as soon as one of these orders is hit, the other is cancelled. That’s why it’s called an OCO (one-cancels-other) order. The beauty of this is that these exit orders no longer rely on your Internet connection being up. The orders have been sent to your broker and they now sit on the broker’s servers – which are almost guaranteed to always be connected to the exchange – and are executed remotely. 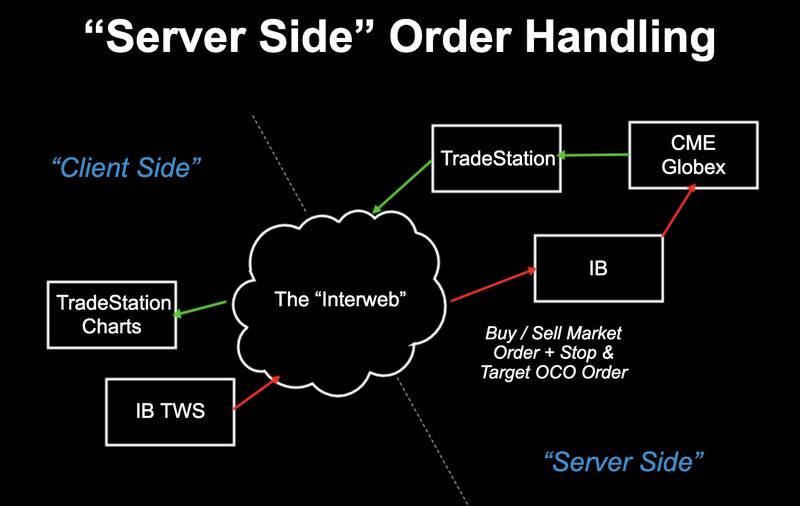 Not all brokers have this “server side” order handling. I use Interactive Brokers and it works. However, I’ve heard from followers and customers that not all broker order entry systems have this functionality. So check first. For a fuller explanation, with video, check out this article: Server Side Order Handling. On to step 4 of the Trading Backup Plan. Step 3 dealt with the scenario of losing Internet connection while in a trade. But what about getting your charts back as quickly as possible when the Internet goes down? Not so long ago, the best recommendation was to have 2 Internet providers – one primary and one backup; one cable and one ADSL. But these days mobile data services are getting better and better. With 4G now the norm in most urban areas, you can get Internet speeds of 5 to 50 Mbps via your cell phone. The simplest solution now is to use a cell phone that has mobile hotspot functionality. My Google Pixel 2 has this feature built-in and since I use Google Fi as my “carrier”, I can get data connections wherever I travel. In the last 12 months, I’ve used the Google Fi data connection to run TradeStation in the US, Australia, France, UK, Italy and Spain without a problem. I can also run up to 5 devices at the same time – so that covers my MacBook Pro, my tablet, Mrs. Emini-Watch’s MacBook Pro and her cell phone. As a result, I’ve ditched my old portable wifi hotspot device (that frankly was always a pain to use, with different data SIM cards for every country). Step 5 is pretty obvious. Keep a post-it-note or printout of your broker’s trade desk telephone numbers plus your account numbers and passwords close to your trading computer. That way, as soon as you encounter a problem, you can phone in, check your position and decide to exit or keep your stop and profit target orders in. Fellow traders will always tell you their horror stories about how slow their last broker was to answer the phone or how stupid they were. However, in my experience, whenever I’ve had to call my broker the response was almost instantaneous and helpful. Sure, plan for the worst but sometimes you might be surprised. If you trade from home and regularly replace your computer hardware, then just keep your last machine and have it ready to go in an emergency. But if you don’t have a “home base” this is not an optimal solution. If you travel a lot, you need a second computer that’s light weight, easy to sync with your trading computer and has other uses (such as media consumption). The Chrome OS is incredibly secure and robust (here’s why fin-tech company Square use Pixelbooks). Plus it syncs with all my Google apps, so as soon as I boot it up it’s up-to-date with all my documents, applications, bookmarks, passwords, etc. I can literally have a mirror image of my trading computer up and running in seconds. Plus it’s a great replacement for an iPad to watch movies on. However, there is a drawback. Two of my trading applications aren’t available for Chromebooks: Interactive Broker’s TWS and TradeStation. The Interactive Broker TWS app runs on Java and is not easy to run on a Chromebook. But their browser based trading app is almost as good and so I use that instead. Finding a workaround for TradeStation though is a little harder. What I have chosen to do is have a Google Cloud Platform account set up and ready to go with a VM instance – that’s a virtual machine in the cloud running the Windows Server operating system with TradeStation loaded up. Then, if my hardware goes down, all I have to do is activate the VM and import my latest TradeStation backup. This virtual machine, located in a Google data centre on the East Coast, is then “viewed” on my Pixelbook using Microsoft Remote Desktop software. There is a little delay when working on TradeStation remotely, but manageable. The trickiest thing was getting the screen resolutions to play nicely together. I’ll do a full article and video on this setup later. UPS stands for ‘Uninterruptible Power Supply’. If your computer is powered through the mains, you’ll need to be prepared for a power outage. The simplest thing to do is connect your computer to the mains though a UPS. Then if the mains power goes down, your computer will keep running. This also has the added advantage of protecting you from voltage spikes, as most UPS have in-built surge protectors. Alternatively, trade using a laptop. That way, if the mains power goes down, your laptop battery will kick in and your computer will not crash. And just in case, use a surge protector when connecting your laptop to the mains. Use your trading platform’s auto-backup feature. This “no brainer” suggestion takes 3-minutes to action and then you’re setup for good. So check out your platform’s tutorials and help guides. Use a cloud backup service, like Google Drive. Yes, this option costs a little bit of money. But the peace-of-mind is priceless. It’s a modern solution to a modern problem. Use a broker with “server side” order handling. Possibly the most important suggestion in the trading backup plan. So go check out your broker’s discussion forums or call their tech team. Use a cell phone that can act as a mobile hotspot. This is an easy way to have a backup Internet connection. Just make sure your mobile carrier is not the same as your home Internet service provider. Keep your broker’s telephone number handy. You’ll be stuck if your Internet goes down and you can’t do a Google search for your broker’s contact details. Write them down on a post-it note and stick them to your computer. Have a backup computer, like a Chromebook, ready to go. The beauty of a Chromebook is it’s very easy to sync with your main trading computer. But you’ll need to have access to TradeStation on a virtual machine in the cloud. Use a laptop or power your computer with a UPS. Lastly, be prepared for a mains electricity outage. Either rely on your laptop’s battery or connect your computer through an uninterruptible power supply (UPS). If you’ve not got a trading backup plan or have been thinking about it and just haven’t got around to it … Just do it!